Nalboor Tiles Bianco Dolomoti Why is Bianco Dolomiti Such a Popular Marble Tile? Why is Bianco Dolomiti Such a Popular Marble Tile? Lately, you may have noticed that Bianco Dolomiti as the preferred marble tile that building contractors ask for when constructing high-end projects in certain retail stores. However, Bianco Dolomiti is not reserved just for public builds. In fact, marble tile of any kind can complement almost any décor. It’s just a matter of aesthetics and what people prefer—and also what they can afford. Bianco Dolomiti leans more on the expensive side of the marble tile market. As a result, not every building contractor is jumping in line to stock this quality material in there warehouse—as much as they would probably like to, it all depends on the market in which their building for, and if they can get a return on investment. For residential developments, you might not see much Bianco Dolomiti because for these kinds of projects, you’ll most likely find the Adalia Cappuccino or the Crema Bella is the preferred choice, something that has a warm and neutral tone. They also range on the least expensive side of marble tile. At one time, the Adalia Cappuccino and the Crema Bella may have been considered the Bianco Dolomiti, but as more builders started incorporating it into their build, it’s become somewhat of a common upgrade. Bianco Dolomiti’s surface is different from most of the other natural marble tiles. The surface of other tiles might have a more aquatic-looking movement with colors organically spread throughout the slab, producing a wavy appearance. Unisex Look – The white background offers a clean palate while the harsh grey veining dims down the main color, softening the overall look that creates a warmer tone of what otherwise might be a bright white tile. Popular for High End Retail Boutiques – Incorporating a tile with a wavy surface could look a little too busy when you’re trying to attract a buyer’s attention toward merchandise. The Bianco Dolomiti serves as a nice backdrop for such purposes. Versatile for Different Builds – As aforementioned, Bianco Dolomiti isn’t just for high-end boutiques. There are million-dollar homes that may have this tile installed in their build. But here again, it’s up to the builder and his or her client to determine if this tile is within budget. Using this coveted tile as a small feature can make an even bigger impact! If you prefer, you can install this beautiful tile as shelving, a vanity tray, or even as a backsplash to your kitchen walls. 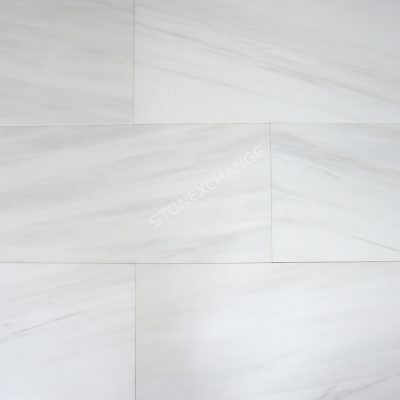 Appeals to a Wide Pool of Buyers – There are very few buyers who wouldn’t appreciate marble tile, but if you can offer them the option of installing Bianco Dolomiti, chances are they will pay the premium price to get it. It’s Pricy, Which Means its Unique – Sometimes, the most expensive things are coveted because they are pricy. Bianco Dolomiti starts out at $6.95 per square foot for 12” x 12” x 3/8”, but that’s not to say that this is the only reason why this is a popular tile. Oftentimes, with popularity comes exclusivity. If a building material is exclusive because only a few builders buy it—and it’s used for commercial purposes, then it can be argued that it’s a popular building material. Supply and demand comes in to play here, so it could be difficult to determine what exactly makes Bianco Dolomiti popular. It’s the chicken and the egg scenario. The end result is that its unique exclusivity reflects a wealthy lifestyle. You’ll find that most slates of marble will have natural cracks and fissures. Although this is natural stone, you should expect to see some repairs from the factory. Depending on the manufacturer, the repair may not even be noticeable. The overall quality of the repair depends on the manufacturing distributor. How Abrasive is Bianco Dolomiti? One of the positive attributes of Bianco Dolomiti is that it has low abrasion resistance. However, with all marble surfaces, light scratching can happen if it is exposed to other abrasives. Without a proper sealant, the surface will lose its luster over a period of time from other abrasives. That’s why it’s important to know how to treat your marble tile when cleaning it. Bianco Dolomiti is very sensitive to acids. If you’re using this as a kitchen countertop, you should know that any type of acidic substance would eventually etch the surface if it’s exposed to acidic foods like tomatoes or lemons. So use a cutting board when you prepare foods. To clean, just use a warm non-acidic soap with a cotton cloth. Also, if you’re installing this as a floor application, be sure to place a mat at the door to minimize dirt and mud from getting tracked in. This will ensure the longevity of this kind of tile. Marble in general is waterproof. However, it does have a medium to high absorption rate, but this is on a microscopic level. What this means is that it can eventually soak up liquids if it’s not attended to right away. This is only a concern if you spill colored liquids onto its surface as that substance will slowly seep into the pours enough to discolor the surface it it’s not sealed. Find all of the sealant products Nalboor Tiles has to offer here. Call Nalboor Tiles for more information about Bianco Dolomiti, sealants, and other natural stone tiles at 305-501-4548 or contact us online today.